Early 20o6 I visited ‘Cosy Cove’ and ‘Cosy Home’ owned by Melina Loonie. I instanly fell in love with the place, its beach with the wooden structure for dance and sitting socialising with the other residents. It was a popular place with a lot of activity. On my travels I noticed a big open structure fitting neatly and majestically on a rocky outcrop, I inquired who the owner was and set out to meet Sudane Erato. This photo is dated 8 April 2006, it probably was taken around the time of that first visit. The quality is not so good and doesn’t reflect the real ambiant atmosphere. 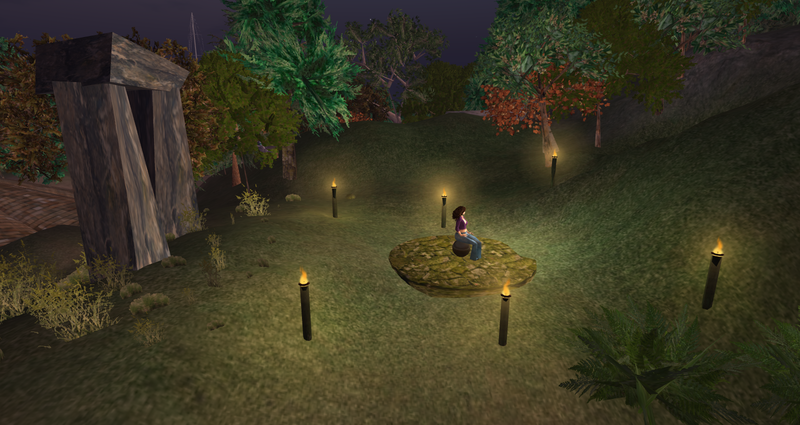 Those moments happened in Second Life® but one is so immersed that it could have happened in real life. Sudane Erato took me under her wing and explained patiently all she knew about building and scripting in Second Life. We had many discussions and practical demonstrations; I got stuck many times and Sudane was always there with her help at hand. Sudane made this spiritual gateway for me on the land I owned on Cosy Cove, it was a big wooded area with two sides next to the water. The gateway was near the top of the hill, the torches came on at night and the centre was the teleporter to my building platform on which I build many homes and objects. I loved that place and Sudane is still my friend and close to my heart.